The global market for medical oxygen concentrators is mainly fuelled by the growing prevalence of COPD globally. The swift rise in the patient pool ailing from other lung diseases such as smoking-related lung conditions, asthma, and lung cancer is leading to an increasing demand for oxygen supply units. Oxygen supply units such as medical oxygen concentrators display widespread demand due to advantages of portability and uninterrupted oxygen supply. In addition, favorable government policies area also boosting the uptake of medical oxygen concentrators. On the other hand, however, a large number of oxygen concentrators that have continuous flow technology mechanism account for huge wastage of energy and oxygen even when not in use. Furthermore, the high cost of portable oxygen concentrators is limiting their adoption in emerging economies. The global market for medical oxygen concentrators is predicted to be valued at US$2.41 bn by 2024, expanding at a CAGR of 8.5% between 2016 and 2024. The market was valued at US$1.25 bn in 2016. The report studies the medical oxygen concentrators market based on a few parameters, viz. modality, technology, end-user, and geography. Depending on modality, this market is bifurcated into portable and stationary. In 2015, portable oxygen concentrators displayed the leading demand due to attributes of easy to carry, light weight, small size, and function on rechargeable lithium batteries. Portable oxygen concentrators can be used for individuals of any age without disrupting their everyday activities. Due to several advantages of portable oxygen concentrators, they are likely to acquire the leading market share over the forecast period. Stationary oxygen concentrators, on the other hand, operate on alternating current and are suitable to be used while at home. By technology, continuous flow technology and pulse flow technology are the segments into which the medical oxygen concentrators market is divided. Vis-à-vis growth rate, pulse flow technology currently leads the medical oxygen concentrators market. This is because pulse flow technology discharges concentrated oxygen only during inhalation. As such, continuous working of oxygen concentrators is not required which helps save considerable power. By end user, home care, hospitals, and ambulatory surgical centers are the key segments into which the medical oxygen concentrators market is divided. Among them, the home care segment currently accounts for the leading revenue contribution to the overall market. Geography-wise, the global market for medical oxygen concentrators could be segmented into North America, Asia Pacific, Europe, Middle East and Africa, and Latin America. Vis-à-vis volume, North America displayed the leading demand for medical oxygen concentrators in 2015 due to significant use of portable oxygen concentrators for home care needs. In the years ahead too, the region is likely to continue to hold dominance. Europe is the second-leading market owing to substantial awareness among consumers regarding advantages of oxygen concentrators over their conventional counterparts. 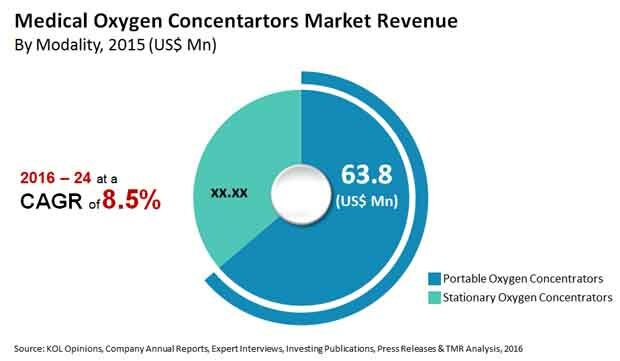 Asia Pacific and Latin America collectively held 31.4% share in the global medical oxygen concentrators market in 2015, and are perceived as high potential regions due to unmet medical demand. Leading players in the global medical oxygen concentrators market include Chart Industries Inc., Invacare Corporation, Resmed Inc., Precision Medical Inc., O2 Concepts LLC, Inogen Inc., Koninklijke Philips N.V., Drive DeVilbiss Healthcare LLC, Besco Medical Co.Ltd., and GCE Group. Medical oxygen concentrators are used by patients suffering from COPD and other respiratory diseases. Patients having low level of oxygen in their blood are prescribed to use oxygen concentrators. Oxygen concentrators are to be used only with prescription and cannot be purchased over the counter. Medical oxygen concentrators work either on rechargeable lithium batteries or by continuous electric supply. The medical oxygen concentrators are produces oxygen from the surrounding air. It works on the principle of compression of air by which the concentrators are prevented from overheating. After taking the air from the surrounding nitrogen is removed through the air filters and with adjusted delivery rate purifies oxygen is delivered to the patients with the help of nasal cannula or mask. The global medical oxygen concentrators market is segmented by modality, technology, end users and geography. By modality the global medical oxygen concentrator market is further segmented into portable oxygen concentrators and stationary oxygen concentrators. According to technology the market is segmented further by pulse flow technology and continuous flow technology. By end users the market is segmented into hospitals, home care and ambulatory surgical centers. In terms of geography the global medical oxygen concentrators market is segmented into North America, Europe, Asia Pacific, Latin America and Middle East and Africa. The research is a combination of primary and secondary research, conducted for understanding and arriving at trends, used to forecast the expected revenue of the medical oxygen concentrator market in the near future. Primary research formed the bulk of our research efforts with information collected from in-depth interviews and discussions with a number of key industry experts and opinion leaders. Secondary research involved study of company websites, annual reports, press releases, investor presentations, analyst presentation and various international and national databases. The report provides estimated market size in terms of US$ Mn for each by modality, technology, end user, and geography for the period 2014 to 2024, considering the macro and micro environmental factors. The revenue generated from each product was calculated by considering number of products used in the procedures and their market demand as per their use, prevalence rate of disease, number of product launched, annual revenue generated by products of each sub segment, trends in industry, end user trend, and adoption rate across all the geographies. The market report comprises an elaborated executive summary, which includes market snapshot that provides information about various segments of the market. It also provides information and data analysis of the market with respect to market segments based on modality, technology, end-user, and geography. The market overview section of the report analyzes market dynamics such as drivers, restraints and opportunities that influences the medical oxygen concentrators market in the current and future scenario. The report also profiles the major players in the market and provides various attributes such as company overview, financial overview, product portfolio, business strategies, and recent developments. Major companies profiled in the monoclonal antibody therapeutics market are Chart Industries, Inc., Inogen, Inc., Invacare Corporation, Koninklijke Philips N.V., Resmed Inc., Drive DeVilbiss Healthcare LLC., Precision Medical, Inc., Besco Medical Co. Ltd., O2 Concepts LLC, GCE Group and others.